The perfect costume for your pooch! If you've got an open-minded pooch you want to outfit for the holidays, a Max the Grinch dog costume is a humorous and easy choice. Posing as an evil-in-disquise Santa, the infamous Grinch enlists the help of his loyal companion Max to load up and pull his sleigh in an evil ploy to steal the Christmas gifts from all the Whos in Whoville in the beloved Dr. Seuss tale, How the Grinch Stole Christmas. While the Grinch costume is tricky and requires a mask or green face paint for best results, Max is an easy pet costume that requires little more than a standard set of reindeer-inspired pet antlers. 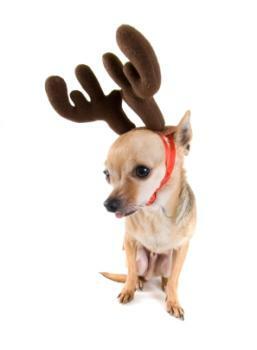 Once you've gathered your basic supplies, you're ready to start crafting your own set of pet antlers. Start by wrapping a plain headband with green felt. Cut the felt square to size and affix with a dollop of hot glue or fabric glue. Cut four small ears out of brown felt. Hand sew with a basic needle and thread two like sides together and stuff with a bit of cotton batting. For quicker sewing, consider using a stash of yarn with an embroidery needle. Sew a line up the center to create a realistic crease. Cut four large antlers out of red felt. Once you've sewn both the antlers and the ears, you can connect them with a seam. Add some festive glitter or jingle bells to the headpiece for added adornment. Affix the headpiece to the headband by sewing large loops around the base of the headband and the felt pieces. Place on your dog's head and make any necessary adjustments. Bear in mind that a costume that's ill-fitting or uncomfortable can present both a safety or health hazard to your pet. Make sure your pet's antlers don't impact the sight or breathing of your pet when crafting your unique Max suit. If your dog decides the dress-up gig is not their thing, heed their signs and remove any or all of their costume attire. Dressing up pets can be a challenge, and success widely depends on your dog's personality and the selected costume choice. Max the Grinch dog and his simplistic antlers are usually a bearable costume choice that most pets will withstand for an ample amount of time. Take a few cues from your pet, if your pooch is seemingly uncomfortable or fussing with their headpiece, grab the camera, snap a few quick pictures of your pet for memories, and get them back into their comfort zone as soon as possible.